With 21 players remaining, the average chip stack is now 560,000. This will be the final level of play on Day 2. The bubble hand of the $2,500 Foxwoods Poker Classic Main Event. 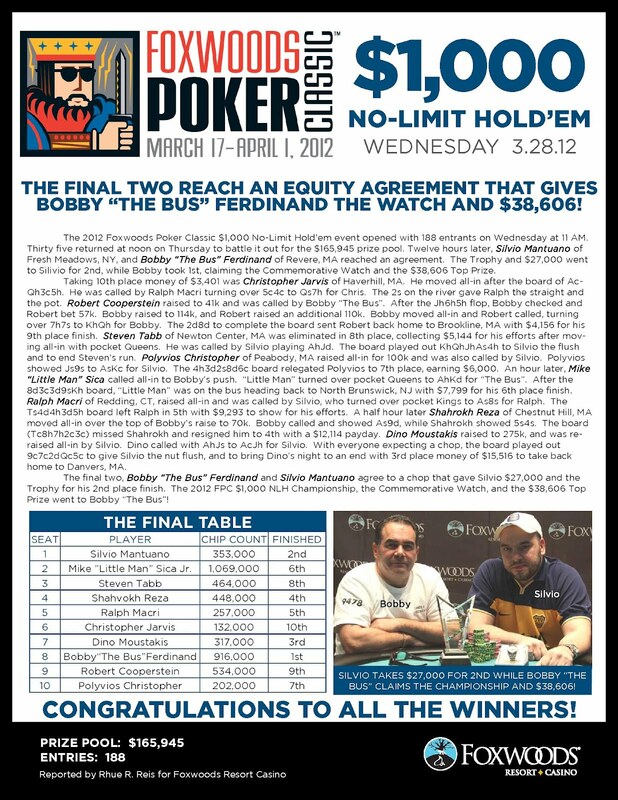 The Foxwoods Poker Classic Main Event is in the Money! We are down to the final 36 players in the $2,500 Foxwoods Poker Classic Main Event. All players are now in the money. Players are redrawing for seats at the final four tables. The players in the $2,500 Foxwoods Poker Classic Main Event are now on dinner break. Play will resume in 75 minutes. With 42 players remaining, the average chip stack is now 280,000. We are down to the final five tables in the $2,500 Foxwoods Poker Classic Main Event. The blinds are currently 3,000-6,000 with a 500 ante. With 44 players remaining, the average chip stack is now 267,000. The final 36 players will finish in the money. Despite building his stack up a bit, Dwyte Pilgrim has been eliminated when he ran pocket threes into his opponent's pocket aces. There are now 55 players remaining with the top 36 finishing in the money. Dwyte Pilgrim and his opponent get all-in before the flop. Pilgrim holds [Tc][Ts] while his opponent turns over [7d][7h]. The flop comes out [9h][8d][2h] and Pilgrim maintains his lead. The turn is the [5s], giving his opponent outs to a straight. The [6h] then falls on the river, completing his opponent's straight and leaving Pilgrim with only 17,000 in chips. Jay WhoJedi Newnum talks with Dwyte Pilgrim on Day 2 of the $2,500 Foxwoods Poker Classic Main Event. 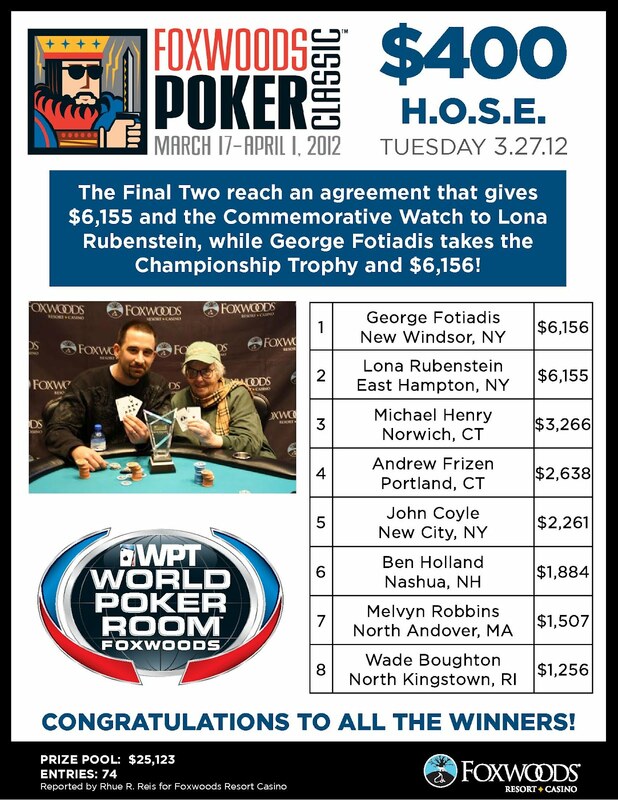 We had a total of 381 players in the $230 No-Limit Hold 'em Super Bounty event at the 2012 Foxwoods Poker Classic. Darren Elias had a rough and quick Day 2. After starting the day with 185,000 in chips, he drew Dwyte Pilgrim to his immediate right. Unfortunately for Elias, he has been eliminated late into the second level of today's action. 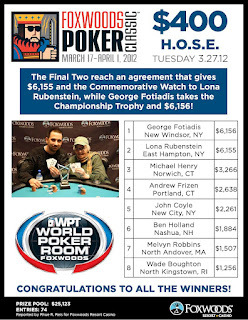 Defending Foxwoods Poker Classic Main Event Champion Ronnie Pease has been eliminated from the 2012 FPC Main Event. 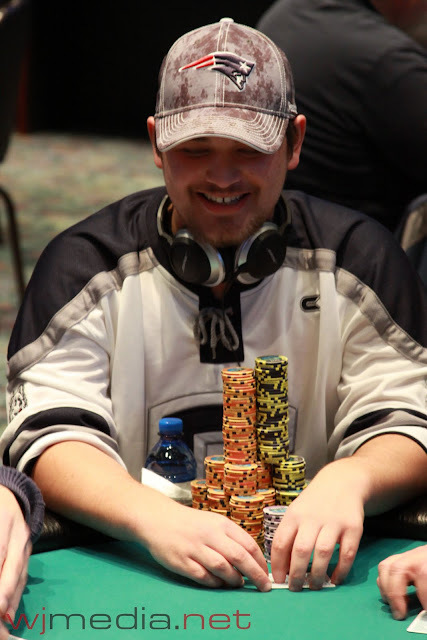 Last year, Pease was part of a three-way chop at the end of the event, taking home more than $108,000. Pease was knocked out by his friend, Soheb Porbandarwala, after he four-bet all-in before the flop and was called by Porbandarwala. The A-5 of Pease was not able to catch up to the pocket queens of Porbandarwala, eliminating him from the Main Event. Two of the biggest names to advance to Day 2, Darren Elias and Dwyte Pilgrim, find themselves seated next to each other. Here are the chip counts and seating assignments at the live stream feature table. Play has come to an end on Day 1 of the Foxwoods Poker Classic Main Event. There looks to be 105 players remaining. Play will resume at 11am tomorrow. 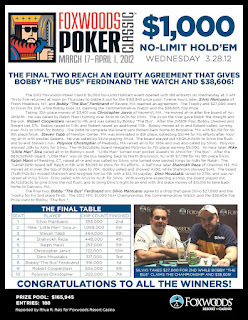 Final chip counts and Day 2 seat assignments will be posted shortly here on FoxwoodsPoker.com. There are currently 124 players remaining and the average chip stack is 94,800. This will be the final level of play on Day 1 of the $2,500 FPC Main Event.